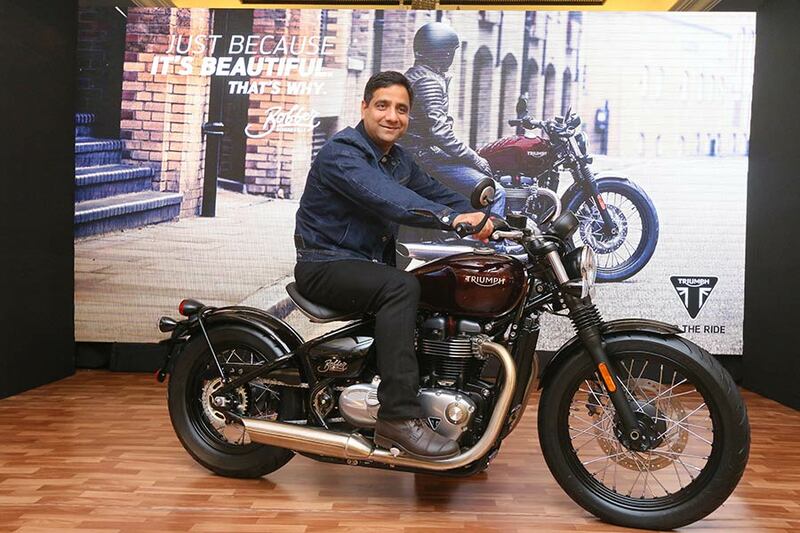 Triumph Motorcycles today launched Bonneville Bobber motorcycle in India at INR 9.09 Lakhs (Ex-showroom Delhi). control, to have it ride just like a Triumph should. The Triumph Bobber delivers a truly class defining riding dynamic, further strengthening our repertoire in India. 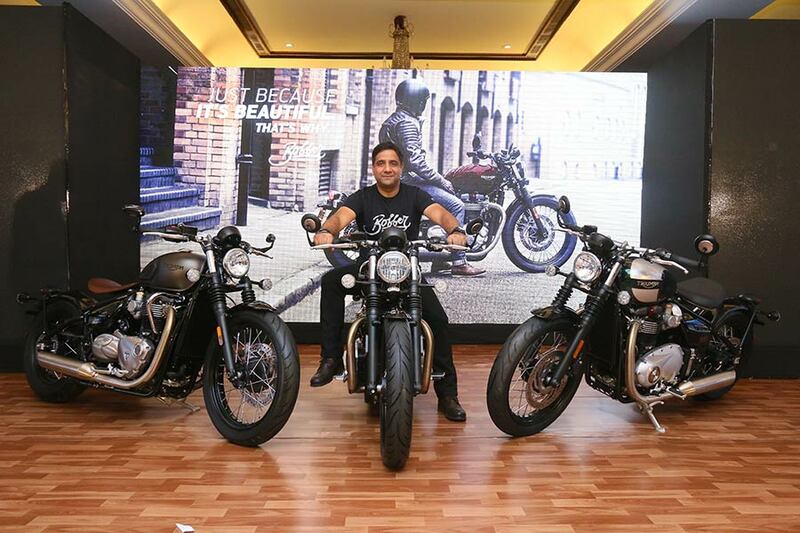 Triumph Motorcycles is the fastest growing luxury motorcycle brand in India. With segment-leading technology, safety and rideability our motorcycles ensure a complete riding experience. Taking our obsession with creating THE perfect ride forward, Triumph has set a high benchmark for the luxury two-wheeler segment. With a hard-to-beat product lineup across 5 categories, collaborations with several motorsports events and training schools In India, our goal is not just to dominate the market but to upgrade the entire biking experience in India. The latest addition to the Bonneville family, Triumph introduces the all-new premium custom Bonneville Bobber. Born in an unparalleled bloodline of Triumph bobber customs that stretch all the way back to the 1940’s, it perfectly encapsulates the minimalist styling principles, muscular stance and purposeful engineering attitude of a genuine bobber. Stripping the Bonneville T120 back to its purest essence, it delivers all the hallmarks of a real bobber, with clean lines and low stance, single seat, wide flat bars, minimal bodywork and headlight, sculpted tank, wire spoked wheels with wide rear wheel and that all-important hard tail look. The Bobber’s stunning features include an authentic battery box with stainless steel strap, bar end mirrors, rear mudguard loop, carb styled twin throttle bodies, broad adjustable levers, traditional rubber gaiters, classic rear ‘drum brake’ inspired hub, new side panel and sprocket cover with removable inspection cap. A genuine factory custom, the Bobber features a whole host of premium finishes including bronze 1200HT engine badges and the signature Triumph makers mark triangle, brushed engine covers, branded locking fuel cap, silver satin and graphite handlebar risers. The slotted seat design system allows the rider to position the seat ‘up and forward’ for dynamic riding in a roadster position and ‘down and backwards’ for cruising in a more traditional riding position. This is complimented by a simple quick-release function for the clocks that enables riders to adjust the position to complement their seating and riding style. Combined with a low seat height of 690mm when in the low seat position, the Bonneville Bobber is truly accessible to all riders. Courtesy of the new generation Bonneville HT engine, the Bobber delivers category-leading torque for a thrilling hot rod ride and a rich exhaust note. Powered by the critically acclaimed 1200cc high torque engine, as fitted in the Bonneville T120, there is a dedicated ‘Bobber’ tune for more torque and power lower down the rev range. The charismatic 270° firing interval ensures a smooth, linear power delivery from the slick six-speed gearbox. Evolved specifically for the Bobber to maximise the riding character, there is a unique twin airbox set up with two filters, unique intake and exhaust system and new output shaft. Delivering the rich new Bobber soundtrack is a beautifully finished brushed stainless steel twin skin exhaust system with ‘slash cut’ sawn off peashooter silencers, which is shorter and lighter than the Bonneville T120. Just like all the new generation Bonnevilles, the Bobber engine delivers modern classic capability with ride-by-wire, for enhanced safety and control from twin classically styled throttle bodies, as well as a sensitively incorporated liquid cooling system with a unique radiator and larger fan. This brings better performance and cleaner, more fuel-efficient riding. The Bobber also has a high first major service interval of 10,000 miles (16,000km). With an all new bespoke frame to suit the unique Bobber geometry and minimal rear end, new forks with bespoke springing and damping, a low seat height, great stand over and first-in-class adjustable riding position the Bobber delivers a truly class defining riding dynamic. rims and inner tubes fitted with Avon Cobra tyres developed specifically for the Bobber. rear, with a category-first AV72 radial tyre with cobra tread pattern for class-leading stability. Finally, to enhance the authentic look the Bobber has classic wire-spoked wheels, with stylish black rims and inner tubes fitted with Avon Cobra tyres developed specifically for the Bobber. With a signature ‘wider rear wheel’ Bobber set up it has a 19’’x2.5’’ on the front, fitted with an Avon Cobra AV71 for reduced mass for high-speed manoeuvrability, and 16’’x3.5’’ wider wheel fitted on the rear, with a category-first AV72 radial tyre with cobra tread pattern for class-leading stability. The Bonneville Bobber has been designed with customising in mind, with over 150 accessories available for more style, detailing and comfort, and for even more performance. For even a more distinctive character, there are high ‘ape hanger’ bars, a statement rider seat and bar end peep mirrors. For riders who are looking for more long distance comfort, there is a stylish comfort seat in a ribbed and quilted version, a heated grip kit and a cruise control kit. To deliver even more performance to the Bobber, Triumph is introducing a new partnership with FOX with a dual branded adjustable rear suspension unit plus a range of new Bobber exhausts from Vance and Hines with beautifully machined aluminium end caps which are adjustable to change the profile. There is a more distinctive and elegant alternative multi-function 5-inch headlamp – Triumph’s first full LED headlight. This comes with a signature style LED DRL (daytime running light) or LED position light (depending on market). With beautiful Triumph branding and class leading performance, both versions will be fully homologated. To make it even easier for riders to personalise their Bobbers, we have also created two exciting ‘inspiration’ kits to use as the starting point to build a Bobber custom, or to have fitted by a dealer as a complete set – the traditional ‘Old School’ kit and the drag racer ‘Quarter Mile’ kit. Brings a more distinctive traditional Bobber vibe with signature ‘ape hanger’ style bars and a host of unique feature accessories including a beautiful hand crafted steel seat pan. Brings a more drag racer Bobber style with signature clip on bars and a host of unique feature accessories including a fully blacked out Vance & Hines exhaust with billet machined end caps.